Borussia Dortmund have made a fine start to the season and could be boosted by the imminent return of Paco Alcacer. 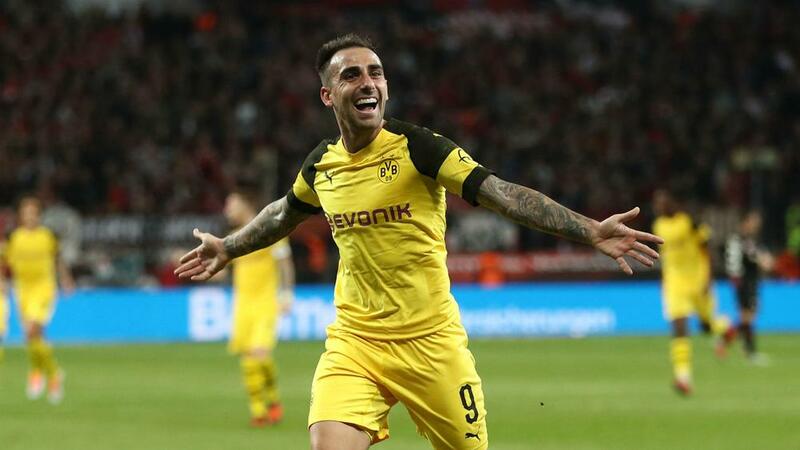 Paco Alcacer could return for Borussia Dortmund's DFB-Pokal clash with Union Berlin on Wednesday after missing the last two matches with a hamstring injury. Alcacer has made a stunning start to life in the Bundesliga with seven goals in four outings, while he also netted three times on international duty with Spain this month. The on-loan Barcelona forward has not featured since being withdrawn at half-time in Dortmund's 4-0 win over Stuttgart on October 20, but coach Lucien Favre is hopeful he could feature in the midweek cup encounter. "He is in training," said Favre. "We'll see if it's possible [for him to play] or not." Favre also confirmed Shinji Kagawa has fully recovered from an ankle injury, the Japan international having not lined up for Dortmund in over a month. Kagawa could be one of several changes against second-tier side Union Berlin as Favre looks to keep his stars fresh. "There are likely to be a few changes, but that's not certain yet," he added. "We know that a cup match is never easy, they will be very compact and well organised. "We want to win. Our focus is only on this game, even though we know that we have a busy schedule."